All of us know how important it is to put good things in our bodies to help us stay strong. That desire was the inspiration for the Bigelow Benefits line, everyday teas that fuel your body with good for you ingredients. But of course, flavor is everything to the Bigelow family, so we designed this line to taste fabulous and help support your well-being. We believe our Benefits teas, as part of your everyday routine, can help you define the life you want to live! TUMMY SOOTHING HERBAL TEA: For a Calm Stomach every day. A blend of spicy ginger, soothing peppermint, blended with stomach calming fennel and licorice root, and finished with a sweet peach. Health beneficial herbal teas never tasted this good before. BIGELOW BENEFITS: Maintaining good health is an everyday job. That's why we make delicious, health beneficial teas that taste so good you'll want t drink them every day. Creating tea rituals for adding extra health benefits every day--We'll drink to that! AMERICAN MADE TEA: In 1945 Ruth Bigelow created our first tea, Constant Comment--a strong, flavorful black tea blended with aromatic orange peel and sweet, warming spices. Today, we offer the only teas grown on American soil, at Charleston Tea Plantation. INCOMPARABLE SINCE 1945: Since Constant Comment Bigelow has been a leader in premium tea. Compare our teas to Twinings, Celestial Seasonings, Numi, Tazo, Teavana, Stash, Traditional Medicinals, Two Rivers, Higgins and Burke, Lipton & taste the difference. 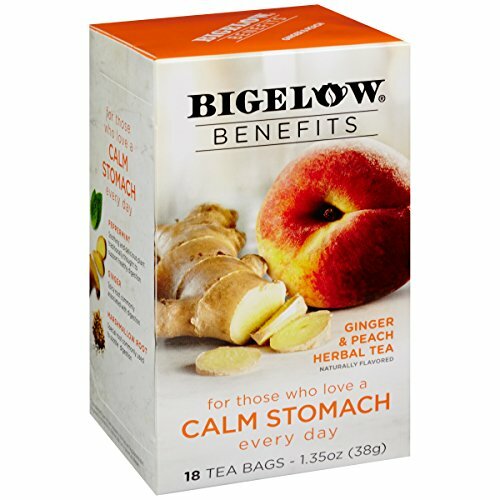 If you have any questions about this product by Bigelow Tea, contact us by completing and submitting the form below. If you are looking for a specif part number, please include it with your message.